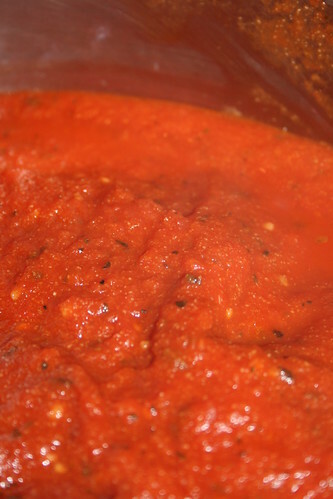 This is an incredibly easy recipe for a sauce that you can use on spaghetti, lasagna, and other dishes calling for tomato sauce. 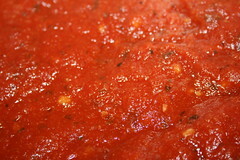 This recipe yields about 3 cups of sauce, so for major operations you might want to double it. Mix ingredients until well incorporated. Cover the pot or pan and bring to a simmer. Stir every once in a while over the next 15 minutes, making sure the sauce doesn't burn on the bottom of the pan. Verdict: Even though I could see little flecks of okara, this tastes like straight-up, classic tomato sauce. It really is amazing how many things you can sneak okara into, adding fiber and protein without affecting the flavor. So far, this is incredibly impressive.